Free North Florida Springs – In part two of our series we will list another springs area that you can visit and not have to pay an entrance fee. Remember, our natural springs are located near a river and have a tendency to flood when the river rises. You really do not want to go into a spring that you cannot see to the bottom of and you should always be aware of snakes, alligators and other creatures that live in the area. Please do not harass the wildlife. Again, most of our springs are regulated by either Federal, State, County or Water Management Districts. Most charge a fee to visit. One of our favorites is Wes Skiles Peacock Springs State Park in Live Oak, Florida. It is more popular with divers than swimmers but the swimming area is pretty nice. It is not as big as some of the more popular springs state parks but nice nonetheless. On a hot summer day when the river is down you can go to this out-of-the-way area and enjoy the large shade trees, dip into very chilly water and have a picnic on the banks. 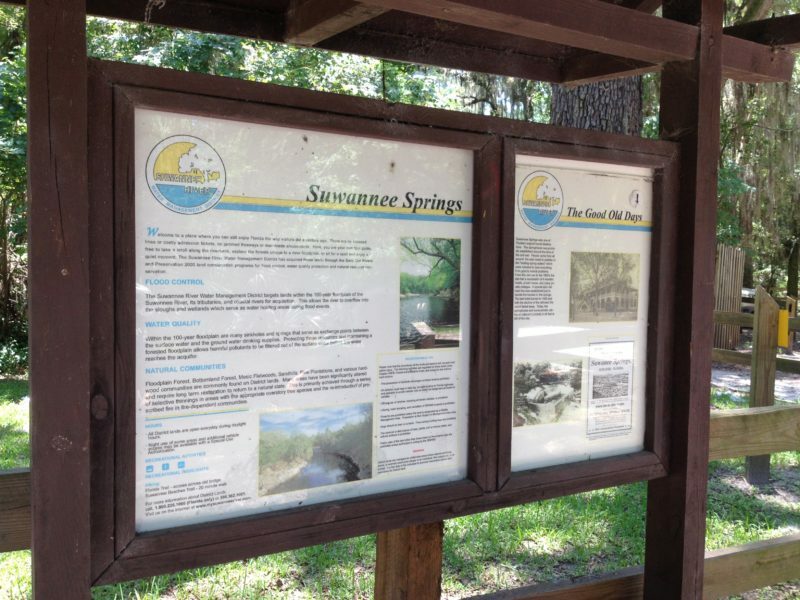 The springs we are featuring today is Suwannee Springs Park in Live Oak, Florida. It is located along the Suwannee River on the same road as the Spirit of the Suwannee Music Park and Campground. That is a privately run, large camping park with lots of music festivals all through the year. Another resource for our Florida Springs you might find useful. This park is unique in that an old spring house ruin with one wall is still standing and protects one side of the spring. We visited with my grand-daughter in June and August 2014. The Suwannee River Water Management District does try to maintain the park but with the way the river floods off and on all through the year it is very difficult to keep it clean and debris free. They do not have a volunteer park host position in this park either due to constant flooding but it would be nice. There are port-a-potties and one or two picnic tables. Or, there use to be picnic tables. Sadly, people have a tendency to take what isn’t chained down. You have to go down some stone and wooden stairs to reach the swimming area which is kind of small. It does have a trail leading over to another beach area along the Suwannee River if you want to fish or brave enough to swim in the tea-colored water. The spring water is cold, may smell like rotten eyes and when clear very nice to swim in. Below are some of the pictures we took during our visit. Enjoy! Till next time, Keep Safe Out There!